Vimanmek Teak Mansion is the world's largest golden teakwood mansion. It was the residence to King Rama V (the current king, His Majesty Bhumibol Adulyadej's, great grandfather) in the early twentieth century . The mansion was modern for its time and the interior is very plush looking. There are eighty-one rooms, some of them octagonal in shape. The quarters are colour co-ordinated and we were guided around the ivory, green, peach and pink sections. Some of the rooms contain antiques from different countries, including pottery from China, a rhinoceros tusk from Africa, crockery from Italy and even a pair of elephant feet in one of the rooms. The guide was very thorough and even pointed out that the wooden floorboards were held down by wooden dowels, not nails. A good idea and saves getting our socks snagged! 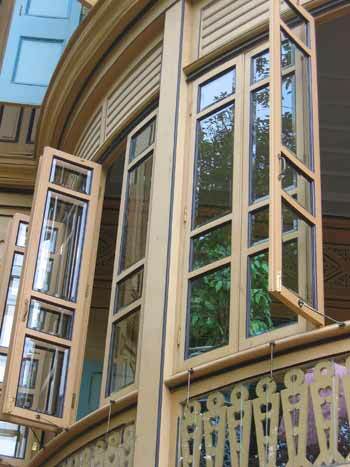 A close-up of the windows at Vimanmek Teak Mansion. There are family photos of the royals on some of the walls and when we got to the one of King Rama VI, the guide told us that he had been educated at Eton College in England. Another reminder of ole Blighty! Surprisingly, the teak mansion survived during the Second World War. One of the bombs, that happened to land in the royal residence, caused a small fire. But after a while, it ran out of steam and only left a tiny black patch on the wooden floor. Amazing considering that the whole mansion is made out of wood. The mansion was interesting to look at and included in the price of admission was a dance show. These are always good entertainment. We nearly got dragged up on stage to dance but managed to wriggle out of doing so (Ian claimed "But I'm filming! ", keeping the camera trained on the dancers). 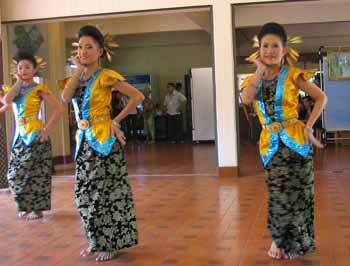 The Dance Show at Vimanmek Teak Mansion. We took a walk around the royal grounds and saw antique clocks, cloth, coral and photographs exhibitions. There are photos of the King playing musical instruments - apparently, he enjoys saxophone and Jazz music. The present King likes taking photos and there is a collection of his snaps on display. Not surprisingly, there are quite a few of his wife, Queen Sirikit, and their children. We even spotted pictures of Her Royal Highness taken with Queen Elizabeth and various other monarchies from around the world. There was one photo that I particularly liked and it was of Queen Sirikit looking out at a blanket of people from a window in New York. We took a cab to Chinatown next to see the Vegetarian Festival. 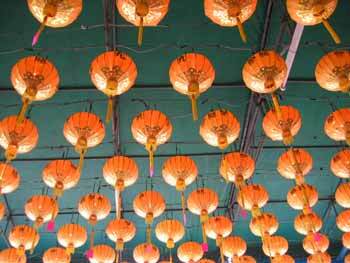 Thai Chinese celebrate this festival fervently for the first nine days of the nineth lunar month. We got dropped off at Wat Mangkom Kamalawat, in the heart of the hub, and it was heaving with people. No shortage of lanterns at the Chinese Vegetarian Festival. At the wat, we noticed that some of the worshippers were dressed in white. There were lots of lanterns hung up and since many people had lit incense sticks, it was very smoky. We stayed for a short while and decided to venture into Chinatown. Last time we were here, we were distracted by some markets and didn't get to see much of Chinatown. This time, we took another detour to a different market but not out of choice. We were literally steered by the crowds into the jam-packed area. It was impossible to move anywhere fast. And every time a motorcyclist or a trolley pusher tried to work his or her way against the current, it made the obstacle course that bit more difficult to wade through. There were no shortage of stalls selling vegetarian food. It smelt delicious and a lot of people were stood by these outlets eating their food. Once we made a path out of there, we found a crowd-free air con restaurant and tucked into some fried rice instead. We were party poopers on this occasion and ordered seafood with our rice. We celebrated in spirit, anyway! Wat's Left to do in Bangkok?